We are pleased to announce the third ASTERICS-OBELICS International School that will be held at LAPP, Annecy from 8 to 12 April 2019. Within the scope of WP4 (DADI) Task 4.3 and WP3 (OBELICS) Task 3.4.2 there will be a face-to-face meeting organized. The IVOA Interoperability Workshops provide a semi-annual venue for discussion and development of Virtual Observatory standards and VO-based applications. From 3rd to 11th October 2018 we organise an international School for Astroparticle Physics for PhD students in Obertrubach Bärnfels, close to Erlangen, Germany. The school will be held in Englisch and is open for international participation. This workshop is modelled after the first ASTERICS Data Provider Forum and Training Event held in 2016 — it will again convene researchers as well as technicians on the topic of on-line publishing of astronomical data and related services. The aim of the school is to provide theoretical and hands-on training on Python development. 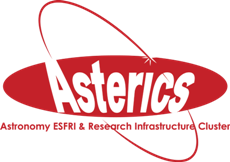 How can you help your fellow ASTERICS colleagues and how can they help you advance in your work? The Virtual Observatory (VO) is opening up new ways of exploiting the huge amount of data provided by the ever-growing number of ground-based and space facilities, as well as by computer simulations. "Astronomy & Astroparticle Physics assets in building the European Open Science Cloud"
This First ASTERICS – OBELICS Workshop addresses challenges in: “Science Data Cloud & Computing models” in Astronomy and Astroparticle physics through users and e-infrastructures engagement. The first event addressing both the ESFRIs and the wider community. First ASTERICS Virtual Observatory School was organised by INTA in Madrid. Participants came here to learn about scietific usage of the VO. The first networking event organised around the requirements of the DADI ESFRI projects. The meeting was organised to allow sharing of information about the ASTERICS project and ASTERICS WP4, about the partners’ expertise, and about the Virtual Observatory (VO) framework and work currently on-going in the partners’ teams.